The Christmas Market will light up historic Brickworks again this year! The popular event features a holiday crafts market, island food vendors, local farm products, live music, libations, and activities for kids and grownups alike. 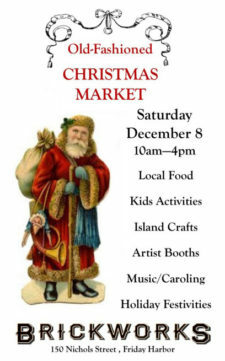 The Old-Fashioned Christmas Market is produced by the San Juan Islands Agricultural Guild. Watch www.fhbrickworks.com for details. The San Juan Islands Agricultural Guild is a community-based 501(c)(3) non-profit organization dedicated to fostering a vibrant, resilient and sustainable local food system in San Juan County, Washington.